This article was originally published by Times Full. Though pesticides are applied on the leaves and stems, a considerable amount of it also gets accumulated on the fruits and vegetables as well. A thorough wash in warm water can help to get rid of these toxins before they are consumed. Very hot or very cold water will not help to remove the entire residue from the produce. Instead use warm water to clean it. There are some popular fruits and vegetable that falls under the dirty list, for having excess chemicals. Soak the vegetables and fruits in a large bowl of water and add half a teaspoon of salt in it. Let the produce sit in the solution for a couple of minutes and then rinse them again with normal clean water. For a better option, store bought vegetable and fruits washers such as Vegfru wash etc can also be used. But the most important thing to be remembered is to always wash the produce before cooking, no matter where they come from. Most pesticides contain organophosphates, carbamates, organochlorines, sulfonylurea, pyreathoids, etc which is potentially harmful for the body. The presence of these contaminants is not just superficial but they also get absorbed by the peel as well. There is no need to buy fancy vegetable and fruit cleansers from the stores when it can be easily prepared at home. Just take about a teaspoon of vinegar in a large fruit bowl and dilute it with water. 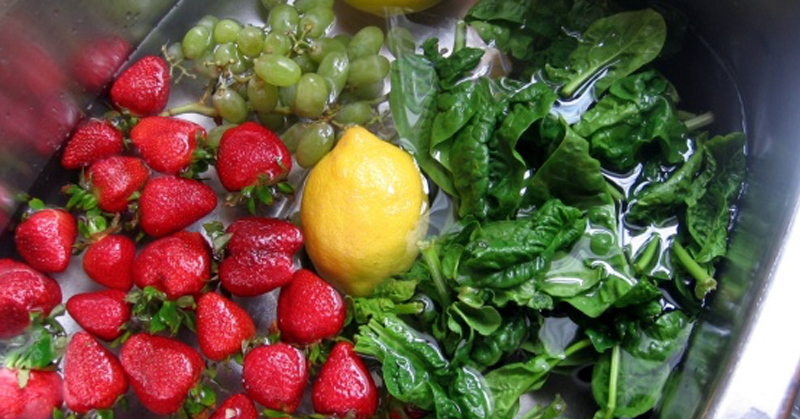 Leave the fruits and vegetables in it for some time and then wash them under tap water. For fruits and vegetables like onions, potatoes, avocados, apples, oranges, ginger, mangoes, carrots, radishes, beets, etc, it is easy to take off the skin. Wash the vegetables again after removing the peel and the use it. The fruits and vegetables that need extra care are the one with accumulated pesticides. Mix one tablespoon of lemon juice with two tablespoons of baking soda and mix well. Then dilute this mixture with one cup of water and use it to spray on the produce and wipe it clean. Never use dish soaps of other detergents to wash the produce as they should not be consumed. Washing and cleaning the fruits and vegetables before cooking is mandatory. So use a damp cloth to wipe the surface clean after rinsing with water. Cleaning the vegetables and fruits with a nice cleaning cloth removes any residues still sticking onto the surface. All these tips and tricks will definitely remove about 85 – 90 % of the pesticide residues from the fruits and vegetables. Apart from these tips, the produce can be blanched as and when possible to further eliminate the traces. Another way to minimize the risk of pesticides from food is to buy the produce from local vendors than the stores. Organic produce can also be purchased as they do not make use of any pesticides, but it can be quite expensive on a daily note. Growing some fruits and vegetables at home, in the backyards is also one of the ways to harvest pesticide free produce.